Schoolboy sets a record by inventing an all new computer system! So, we have a yet another invention by Afreed Islam, a school boy who will be taking his Class X CBSE examinations commencing from March 3. 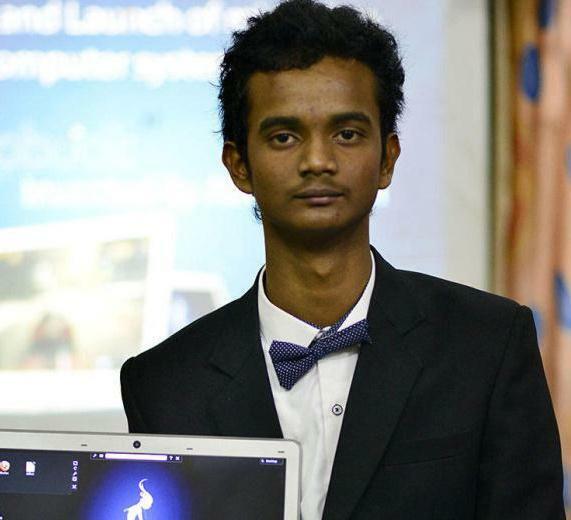 Afreed, who is a student of Little Flower School, Hatigaon introduced his archetype of a computer system that replaces the hard disc by a microchip and offers the option of utilizing and depending on both Windows and Linux-based operating systems at the same time. The computer invention named Revo Book substitutes both mechanical and electronic hard disk drives by a microchip that not only doubles the storage capacity but also overcomes the risk of losing any kind of data. And that’s not all. He has also developed an operating system called ReVo 1X which has also been mounted on the microchip. This system offers numerous benefits including faster execution speed, inbuilt firewall and an entirely exclusive independent operating system. Anupam Barman, Senior Systems Consultant at the Assam Electronics Development Corporation Limited who was also present at the launch of the computer system admired Afreed’s achievement. He also explained how the new system was unique in the sense that since it worked on microchip so there was no risk of losing any kind of data. Hard disk has several moving parts which may crash due to the influence of magnetic field but it is not so in case of microchip. The idea of developing such a system came in Afreed’s mind when he faced certain issues with his own computer system in class V11. He teamed up with a German company for manufacturing the computer system and has also applied for a patent. His invention fulfills all the required criteria for a patent application. « Are the budding inventors form Bhopal actually better than those from the IIT?